Medical Laboratory Professionals Week (MLPW) is April 21-27, 2019! During this week, there will be an array of activities to raise public understanding and appreciation of the impact of the laboratory as it relates to a patient’s diagnosis and care. It's also a way to celebrate those working in the laboratories. Events will include the 10th Clinical Pathology Symposium, lab tours, bingo, a pot luck and more. For more information and a complete schedule of events visit the lab week website. While our almost 1,400 Pathology Department personnel are all passionate about their profession, one group of very dedicated and enthusiastic laboratory staff help in the unique role of liaison between pathology and the entire hospital. They work hard to alleviate, or better yet, prevent problems related to clinical samples. This group, the Laboratory Ambassadors, is always looking for new ways to improve quality and interconnectivity and is currently representing the department at the 2018 Nurses’ Blitz. Nancy Raynal giving a tour.The Lab Ambassadors have been in existence for several years. Kristina Martin, Clinical Pathology Operations Manager, explains, “The Lab Ambassadors goal is to act as envoys between the Pathology laboratories and the Michigan Medicine nurses.” Amy Drouillard, one of our ambassadors who works as a Medical Technologist in Microbiology, states that, “Our mission is to build a line of communication with the nurses. We want them to think of us when they are having an issue and reach out for help.” Besides their normal laboratory duties and clinical unit training, the Ambassadors organize Laboratory Professionals’ Week, give laboratory tours, and answer day-to-day laboratory questions. This year they are joining Point of Care (POC) and Chemistry staff at the Michigan Medicine Nurses’ Blitz (January 22-February 1). This commitment covers 70 hours of interaction and all three shifts. The Blitz is an opportunity for Michigan Medicine nurses to fulfill their competency requirements. Organized by Sheryl Woloskie, Lori DeVries and Mark Erber, of the UMH Professional Development and Education office, the Blitz is located in Towsley Auditorium. 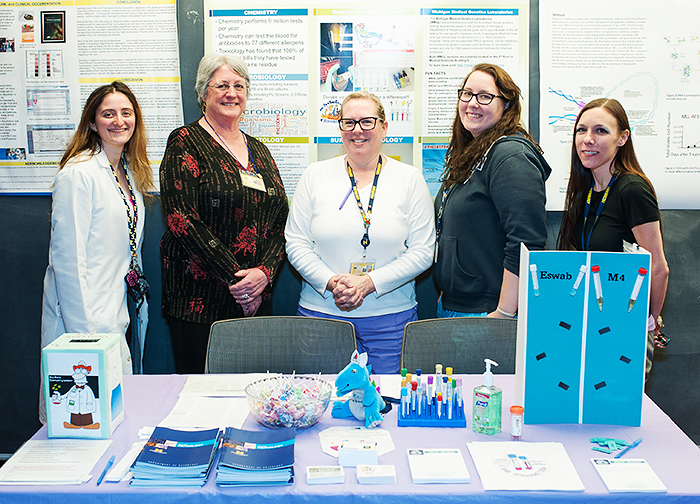 The Lab Ambassadors display helpful tips, Order of Draw cards, and posters highlighting the Pathology laboratories. Besides answering questions about labs, protocols, and sample collections, the Lab Ambassadors are present to encourage interactions, conversations, and camaraderie with the nurses in a friendly environment. In addition to providing answers to key issues for the nurses, their involvement in the Blitz is important because the Pathology POC and Chemistry staff do all the glucose meter certifications for over 1700 ICU nurses. Our mission is to build a line of communication with the nurses. As CP Operations Manager, Kristina Martin is well aware of the positive impact the Lab Ambassadors have. “They provided education to units for proper specimen collection processes, and were helpful in the roll-out of the new blood culture collection bottles.” The unit nurse educators were very receptive to hosting the training and the results were so positive that now nurses feel comfortable directly emailing any questions they have to our Ambassadors. Patient safety is fundamentally improved when lines of communication are open and active between clinical lab staff and nurses. Happily, Pathology is represented by these extraordinary and enthusiastic laboratory professionals who interact with the Michigan Medicine nursing community to facilitate quality patient care, healthcare education, and professional development. Clinical Pathology Symposium Planning Committee: Andrea Arlen, Lisa Brown, Amy Drouillard, Sean Li, Lindsay Kochan, Usha Kota, Kristina Martin, Janelle McCoy, Jill Russell, Linda Perry, Cathy White, and Carol Young. The Department of Pathology has announced that the new Quality Assurance Coordinator for Satellite Support will be Elizabeth McCloud. Satellite Support, which is under the Point of Care group led by Dr. Lee Schroeder, covers all off-site blood draw stations and off-site labs. In her previous position, Ms. McCloud was the Associate Supervisor of the Briarwood and Chelsea Satellites. 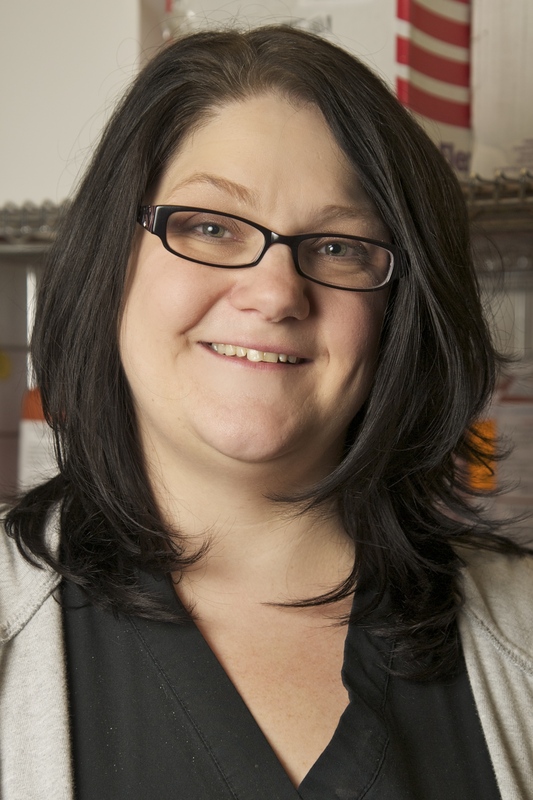 Ms. McCloud will now coordinate QA at the Health Centers in Brighton, Canton, Chelsea, Dexter, East Ann Arbor, Howell, Livonia, Northville, Saline, West Ann Arbor, and Ypsilanti, as well as Domino's Farms and Briarwood Family Medicine, Internal Medicine, and Women's and Children's. Theo Jones, Satellite Support manager, stated, "Liz is going to be an excellent asset to our team in this role as she will be able to capitalize on her years of Pathology experience as well as the strong quality and organizational skill set she brings with her. We're looking forward to having Liz in this role to assist us in improving how we measure and tell the Satellite Support quality story." The American Society for Clinical Laboratory Science (ASCLS) is seeking stories of how laboratorians have impacted patient care. Whether you have caught a pre-analytical error, guided a physician in choosing an appropriate test, or had a critical conversation with another health care professional, the ASCLS wants to hear from you! 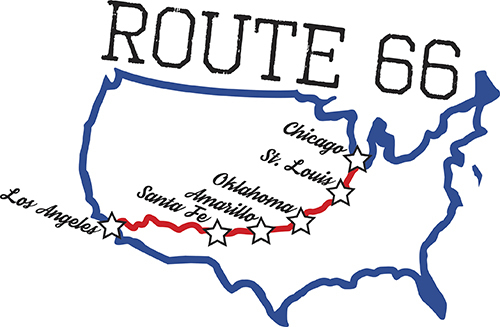 Each story submitted will represent a mile on Route 66 from San Diego, the site of the 2017 ASCLS Annual Meeting, to Chicago, where the Annual Meeting will be held in 2018. You do not have to be a member of the ASCLS to share your story. Help the ASCLS move a mile closer to Chicago, the “ultimate destination of recognition and understanding”. Visit the ASCLS, On the Road to Understanding for more information and to submit your story. In recognition of the vital role that laboratory employees play in quality healthcare for the residents of Michigan, Governor Rick Snyder has proclaimed April 23 - 29, 2017 Medical Laboratory Professionals Week. The American Society for Clinical Laboratory Science - Michigan will host Lab Week Professional Advocacy Day on Tuesday, April 25. Advocacy Day is an opportunity for laboratorians to visit the offices of their legislators in Lansing to share information about the profession and network with others in the field. In addition to this state-wide event, the Department of Pathology's Division of Clinical Pathology will host a symposium on Monday, April 24th. The department's Lab Ambassadors also have a week of activities planned to celebrate, including window decorating, information tables in the hospital cafeteria, and lab tours. Find more information at our Lab Week web page. Gift card drawing for those attending or documenting viewing the video from last quarterly meeting. The meeting will be recorded for those unable to attend. The manufacturer of the chemistry analyzers and reagents used here at UMHS (Siemens Healthineers, Tarrytown NY) has recently announced a change in its calibration material for the direct bilirubin assay in order to bring results more in line with a reference method. This change produces a significant proportional lowering of direct bilirubin results by approximately 30% at elevated direct bilirubin concentrations. 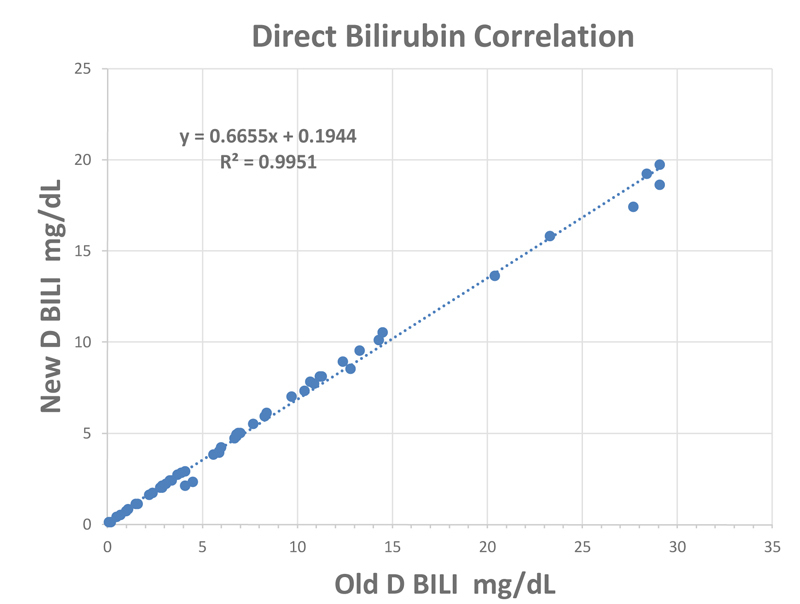 There is very little change in lower values that are within the reference range for direct bilirubin. If trending a patient over time, please take this change into account. The lab will be implementing the new calibration on December 20, 2016. Please direct any questions concerning the change to Dr Don Giacherio at 936-6719 or email dgiacher@umich.edu. Dr. Geoff Baird from the University of Washington came as a Visiting Professor to the Department of Pathology on October 17th. His lecture and interest is “Laboratory Test Utilization Management: What Works, and What Doesn’t”. Hello! My name is Amy Drouillard and I am a U of M Lab Ambassador! I have worked in healthcare for almost 17 years and have always wanted to make a difference. For many moons Iworked the floors as a phlebotomist and saw how the little things mean so much whensomeone is ill. It was life changing to get to know the patients, their families, their hopes andtheir dreams. There were great times laughing with them and hard times when you just neededto be there for them. Now, working in Microbiology, Those very experiences are what has havedriven the fire within me to do more. People in healthcare are a different breed. We eat, sleep, and breathe for our patients.We want them to heal and enjoy every minute of life. The University of Michigan has a saying,"The Michigan Difference". I think the most magnificent part of that saying is how proudly wewear it. Every day when I drive up to our massive hospital I feel a bit overwhelmed. It's like Iwant to pinch myself and say, do I really deserve to be here? To be a part of an organization asamazing as this? I am so proud to tell anybody that will listen where I work and how the work I do really matters. After the rejuvenation of the Lab Ambassador program I really began to understand justhow great this hospital is. I have people coming out of the woodwork to help me shout fromthe rooftops my mission.I have seen that while there are thousands of employees that roamthese halls every day we are truly a community. I have had heads of departments not only showinterest in my thoughts but help me prepare and mentor me on what to do next. This veryoutpouring of support has truly humbled me. When a person has a voice they are unstoppable.I have a voice. And it was given to me by all of you. So remember, while one person cannot do itall, a team can do anything. We can and will make "The Michigan Difference" together. Med tech, Michele McGee shows nursing staff the incubators in Microbiology. For the past decade, the Lab Ambassador Program has been linking the Pathology laboratories with University Hospital nursing units. 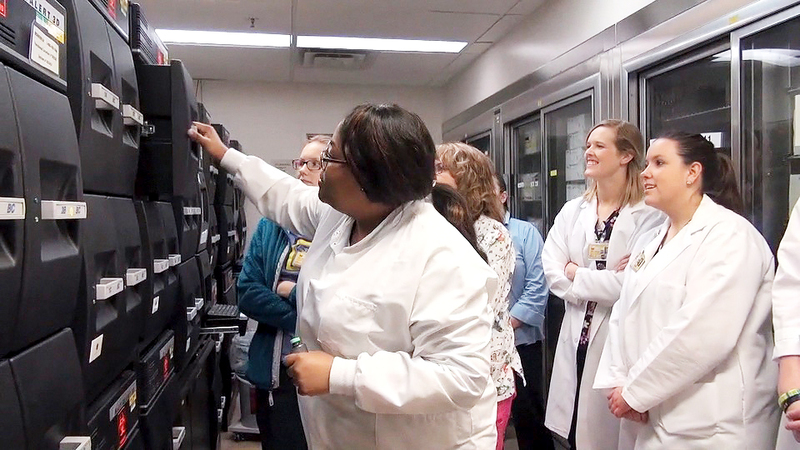 "The program streamlines communication,” explains Clinical Pathology Operations Manager Kristina Martin. Better communication ultimately improves patient safety by allowing nurses and laboratory staff to coordinate efforts to enhance and preserve specimen integrity. As part of the program, medical technologists from the laboratories serve as lab ambassadors, liaisons to the nursing staff in the clinical care units. "It's amazing because they can see who we are,” says Lab Ambassador Amy Drouillard, a technician in the Microbiology Laboratory. "We're always behind a closed door,” but thanks to the program, nurses have a point person to contact when problems arise. This allows questions to be answered quickly and efficiently. 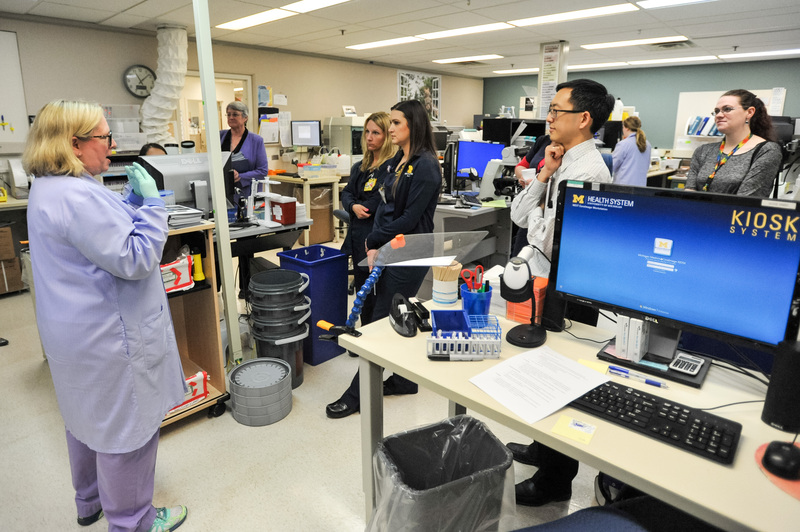 As part of Medical Laboratory Professionals Week, held each year in April, ambassadors organize lab tours, which are recorded for those who are unable to attend in person. Nursing staff and all other interested parties are invited to see the different labs, meet those who work in them, ask questions, and get a better feel for the impact the labs have on patient care. Feedback from those who have attended tours has been very positive, with suggestions that every nurse should be required to tour the laboratories. In addition to improving communication between the nursing units on the patient floors and the laboratories, the Lab Ambassador program increases morale by empowering staff and making them feel they are an important part of the larger team. In addition to Drouillard, the team includes Microbiology's Peggy Mahlmeister and Ashley Powers, Trauma Burn's Ninive Costa, Jazmeen Fortune and Sofia Carro-Hall from Specimen Processing NLNC/ULNC, Tina Gray and Katherine Turner in Chemistry, Cytopathology's Lana Jajko, Administration's Linda Perry, Jennifer Slater and Brian Tapp from Inpatient Phlebotomy, Nancy Raynal from Hematology, and Rebecca Labowitch from Mott Phlebotomy. Laboratory staff interested in joining the Lab Ambassadors Program can contact Amy Drouillard and Linda Perry via a contact form submission.